From the kitchen of One Perfect Bite...This is a lovely pie, don't get me wrong, but I sometimes think those of us who love food and cooking gild the lily. Most folks, when asked to name a typically American food, would choose apple pie. There are even some among us who believe that Abraham Lincoln, somewhere between the Emancipation Proclamation and the Gettysburg Address, first coined the phrase as "American as Apple Pie." Funny thing is that apples aren't native to the United States and "our" apple pie was popular in Europe centuries before it appeared here. 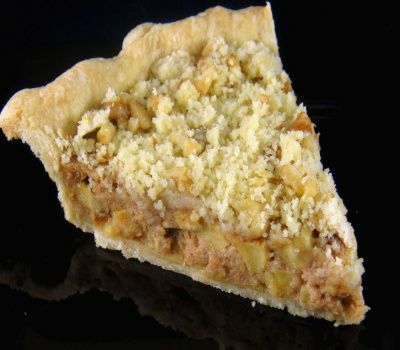 Over time we became the world's largest apple producer and apple pie became associated with our life style and cuisine. Truth be told, hard cider was more popular than pie and was probably the reason our forefathers chose to grow so many apples. Somewhere, in some kitchen, someone with unused custard they didn't want to waste, decided that sugar, apples and cinnamon buried in a crust - called a coffin in merry old England - made too plain a dessert for a forward looking nation. So, they took the custard and poured it over the apples only to discover they had created another problem. The crust used to cover the apples made no sense with a custard filling. Fortunately, American ingenuity surfaced and deduced that a crumbly streusel with a gazillion calories would be a perfect topper for the pie. That's my take on how apple custard pie with streusel topping came to be. I hope you'll take it with a grain of salt. I use cheese custard and caramel syrup in my pie, so it's richer than some and a bit like apple cheesecake. The recipe is a prize winner and was developed by Shelby Thomas for the Georgia Apple Festival. If you have a sweet tooth or know and love someone with one that needs to be assuaged, you'll love this pie. If you're a purist, come back in September for my Mile-High Apple Pie..
1) Preheat oven to 400 degrees F.
2) Combine cheese, caramel topping, sugar, flour, cinnamon, vanilla and salt in a medium bowl and beat until a smooth batter is formed. Add the egg and beat until well-combined. Fold in apples. Pour into pastry lined pan. 3) Place on center rack in oven and bake for 20 minutes. Reduce heat to 350 degrees F. and bake for 10 minutes longer. 4) Meanwhile combine sugar, butter and flour in a small bowl. Cut ingredients together until crumbly. Stir in pecans. 5) Sprinkle topping evenly over top of pie. Bake until golden, about 15 to 20 minutes longer, for 15 to 20 minutes longer. Allow to cool slightly. Serve warm. Yield: 8 servings. Looks yummy -- it's getting close to fall and apple time on the prairie! I think this is a fantastic recipe. Apple can easily go with anything! I love to read your blogs. They offer interesting facts about the foods you make. I love any kind of apple pie--this looks great to me! It really sounds so delicious.. love streusel topping. Sweet apple pie with caramel is right up my alley. interesting to know apple pie was popular in Europe first. It's getting towards apple time here in the mountains. This would be a great way to welcome fall. The apple trees in the NC mountains are weighted down with wonderful apples ripening quickly. I like the idea of a custard and caramel apple pie. Oh my, I do love a good pie and streusel is my favorite topping on fruit pies. I've never combined a custard filling and apples. What could be better? Gilded Lily or not, we never tire of apple recipes. Thanks for some good Kuchen! I've never had an apple custard pie before. It looks amazing, I especially love the streusel topping. My husband just adores any kind of pie, but apple is definitely one of his favorites. I am more partial to the streusel topping! Apple Strusel pie and it's gazillion calories is my favorite type of pie. While this looks insanely good, I'm a simple girl at heart. Looking forward to your mile high apple pie. Love, love, love apple pie. Mini, welcome to One Perfect Bite. I'm so glad you've decided to follow us on a regular basis. We'll talk often. This looks like the perfect apple pie, Mary...apple is actually my favorite pie and I can't wait for this falls apple harvest! i'm trying to still enjoy my summer, but this has got me thinking about fall baking. Hello sorry I am sooo late thank you for warm comment HPS! The apples are just beginning to ripen in PA. I can't wait! I'll be saving this recipe for sure. Hi Louise, I'm so glad you stopped by. I've missed you sinc the "picnic." They called a crust a coffin...ok that kinda creeps me out. Not that it's gonna keep me from eating a gorgeous apple pie like this!! I'd eat it, but I sure will be back for your mile high apple pie. My mom made one and I have never been able to duplicate the crust...She didn't use a recipe! I remember her peeling tons of different types of apples to make it though! Mary, your recipes are wonderful, thanks you! Wow! Apple pie like I've never seen it! Looks so decadent, rich and fabulous! What a wonderful way to make apple pie. One of my favorites. hmmm. Wonderful. A coffin- thats a hoot.